Spiders are creepy; I think that's something that most of us can agree on. 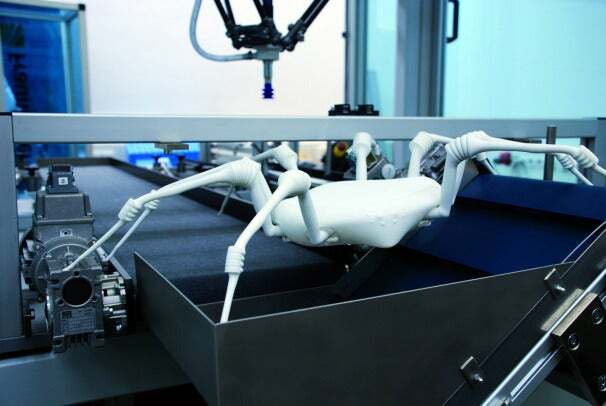 Unfortunately for the "normal" world population, a group of researchers at the Fraunhofer Institute for Manufacturing Engineering and Automation IPA--a research institute that's part of the massive 18,000 employee German research organization Fraunhofer Society--decided that it would be a great (and totally not creepy) idea to make giant 3D-printed spiders with 20-centimeter (7.87 inches) long legs. Created to help emergency crews respond to natural disasters, industrial accidents, and fires, this massive spider is a high-tech assistant that can go where humans can't because of hazards or because it's too difficult to get there. Using its hydraulically operated bellows--an elastic vessel that can be stretched and compressed--this spider is able to drive its limbs and move its joints to get to the most hazardous of places. Not only can this non-living spider creep its way into buildings, but some models of it can also jump, just like the real thing. As it turns out, this spider moves much like a real-life spider, which actually has a type of internal hydraulic system itself. Living spiders don't have muscles to stretch their legs, so they pump fluid into their limbs using high internal pressure to extend their legs. This synthetic spider employed the same concept by using its own hydraulic system to operate the pneumatic bellows that help the artificial limbs bend and extend. To move, the synthetic spider bends its front pairs of legs to pulls itself along; at the same time, it stretches its rear legs to push itself. This high-tech helper may seem large, but it's actually smaller than some of the world's largest spiders, such as the beastly Goliath birdeater which can have legs up to 30 centimeters (12 inches) long! Now that is one creepy spider. This synthetic spider can also carry a number of pieces of electronic equipment--very unlike a real spider--including various sensors and measuring devices depending on the situation. Fraunhofer says that the spider is also very cheap to produce--so cheap, in fact, that it can be thrown out after only one use. This is due to the selective laser sintering (SLS) 3D-printing process, which allows the researchers to make complex and strong structures and as few or as many components as they want all at once. The latter helps reduce costs and material requirements. There's no word on when this spider will be available to the servicemen and other first responders, but someday in the future you might see a several foot long spider creeping its way into a burning building. Follow James Mulroy on Twitter and on StumbleUpon to get the latest in microbe, dinosaur, and death ray news.